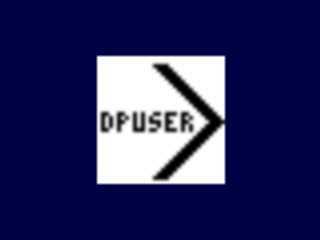 DPUSER is an interactive language that is capable of handling numbers (both real and complex), strings, and matrices. Its main aim is to do astronomical image analysis, for which it provides a comprehensive set of functions, but it can also be used for many other applications. A new version (3.3) is released. For DPUSER, extensive documentation is available, see link below. DPUSER is also part of a graphical front-end (-> QFitsView). For Microsoft Windows, you need this binary (4.7 MB). For Linux, you need this binary (4.4 MB). Don't forget to make this executable (chmod a+x dpuser_3.3)! For Mac OSX, copy this disk image and copy the Application to your favorite location (1.8 MB). You can also download the documentation in gzipped tar format and extract to your local disk. The combined source code of QFitsView and DPUSER is also available. I strongly recommend using the binaries because dpuser/QFitsView are depending on lots of external libraries and is not really trivial to compile. Please understand that I am unable to give any support for compiling.